When you look at your teeth in the mirror, are you distracted by their flaws? Perhaps you’ve even thought about having cosmetic dental work done, but it would require multiple different treatments that may not quite address all the problems you see. Well, there may be a better solution available for you to enhance your smile’s appearance—porcelain veneers. This tiny change can make a surprisingly huge difference and completely transform your teeth. Discoloration in the teeth that doesn’t respond to whitening. After you and one of our experienced dentists determine that porcelain veneers are right for you, he or she will remove just a little bit of your teeth’s enamel to make room for the veneer. Then, we will take impressions of your teeth and precise measurements of your mouth and place temporary veneers. We send this information to a dental lab, where your veneers will be specially crafted. When the final product is ready, you’ll return to our office and have your veneers permanently bonded to the front of your teeth. In as little as two appointments, you could have the smile of your dreams! Natural appearance. Porcelain veneers reflect light much like tooth enamel, so they look amazingly real! Versatile coverage. For multiple flaws, porcelain veneers offer the best way to revamp the appearance of your teeth. Stain resistance. 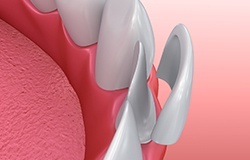 Porcelain veneers resist stains better than tooth enamel. Durability. Porcelain veneers are surprisingly strong, can withstand normal wear and tear, and can last for about 10 years. Comfort. Compatible with gum tissue, the porcelain material shouldn’t cause any irritability. If you want to hide imperfections in your teeth, especially multiple in one tooth, porcelain veneers may be a great option for you. But the best way to know whether you are a good candidate for porcelain veneers is to talk to one of our dentists. They are experts and can guide you to a solution that will get you the smile you’ve always wanted. At Crovatto & Edwards Family Dentistry, we are dedicated to providing personalized dental care that meets your individual needs. We look forward to being able to serve you and help you improve your smile. Contact us today to schedule a consultation! Ask Drs. Crovatto & Edwards Fill out this short form and we'll be in touch.